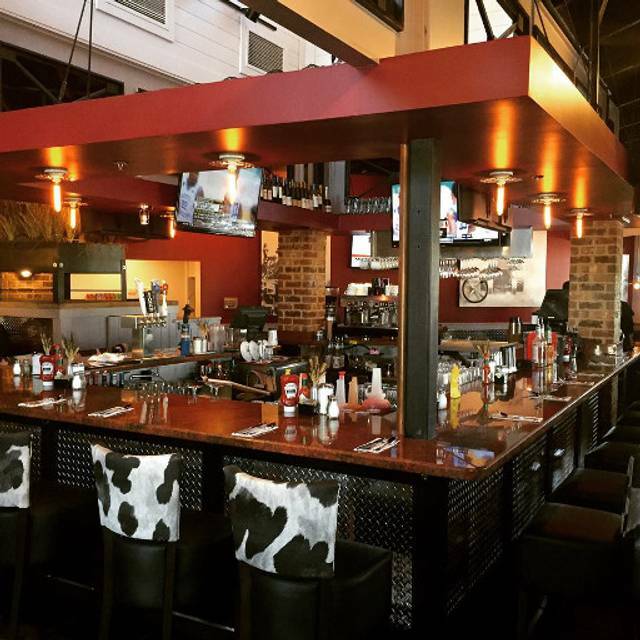 You must make reservations at least 5 minutes in advance of the time at Hash House a Go Go - Plano. We keep the fun in food while pulling from the experiences of farm fresh agriculture, live stock, and old recipes with a twist. We maintain a level of excitement & entertainment within the dining experience, while ensuring excellent service each & every day. made fresh daily! serves up to 4 people! Wonderful brunch with my friends!!! The food and service was outstanding!! Love the corned beef hash and banana latte. Generous portions of good food and good service. I set up a reservation for 10, I arrived 15 minutes before my reservation to check in and even after downsizing my party we still weren’t sat until 45 minutes after our reservation time. The hostess weren’t communicating with each other so after one hostess told me that my party was going to be sat next the other hostess gave our table to another group that arrived AFTER US. The waitress took over 10 minutes to just bring us water and while I was there she never offered to refill my glass. Since we were sat 45 minutes after our reservation I wasn’t able to eat and had to take my food to go. 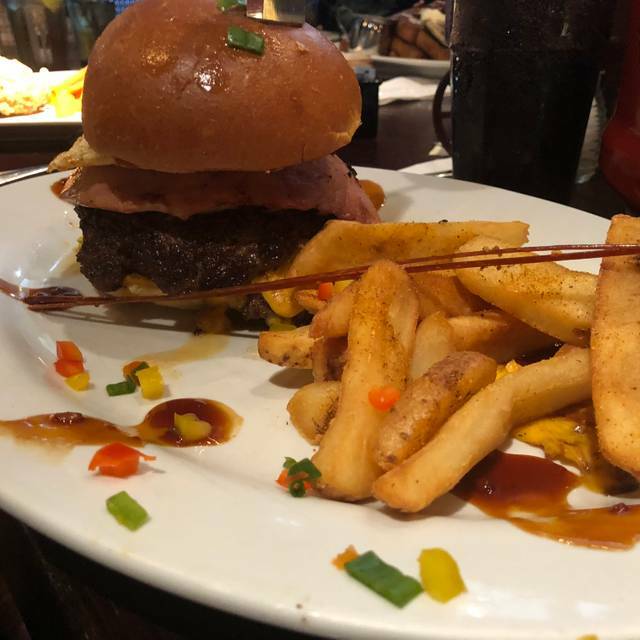 I’m going to give Hash house another chance but this first go round left a pretty bad taste in my mouth. Great food! Large portions and great value! Can’t wait to go back and try something new! I had the Burger with Guacamole and it was amazing! The quality of the food was very good. The portions are huge. Be prepared to take some home. They put there own spin on breakfast but have other great choices too. I would highly recommend them. I would recommend this restaurant. Great food and very good service. Only negative is we all ate too much. This was my second time going there the first time was in Vegas but the experience was no different! The food is amazing and the portions are exceptional I can never finish my whole plate! I definitely will be going back a third time pretty soon! This place is great for both breakfast and lunch. The portions are large, so either come with an empty stomach or ready to take a doggie bag home. Great dining experience!!!! Our party of four was seated immediately upon arrival. Our waiter was polite and courteous. He returned to our table at interval or 3 to 5 minutes to ensure our order needs were taken care of. Once we ordered, the food took a little longer than expected but it was worth the wait. The food portions were humongous and every dish was very delicious. Not too much seasoning on the food. The room ambient was nice and acceptable. It is basic a family environment and not just a place for the adults to hang out. 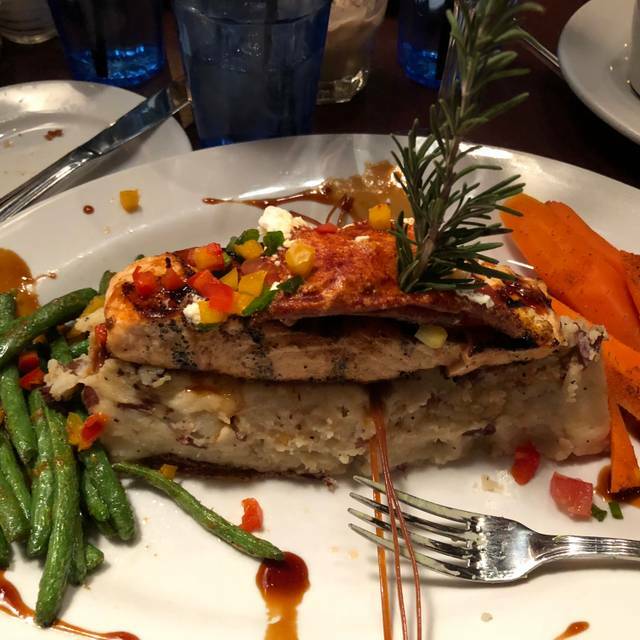 Our overall experience was exceptional and I give Hash House a 5 thumbs up!!! I had a great experience last fall, but this week's visit was subpar. Just getting a waiter to take our order was an effort. Food is consistently great. So I've lived in Plano my whole life but just discovered you on Instagram 6 months ago! (Where have I been??) I learned that you have been there for 3 years and I've been missing out! 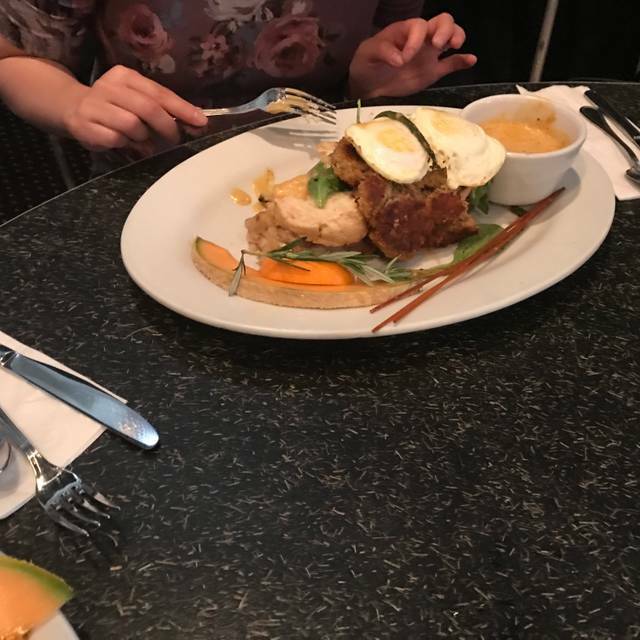 I am Vegan but my boyfriend isn't so its a beautiful thing when we go to a Non Vegan restuarant and I can find something on the menu to eat besides fries! I had a portebello mushroom burger and it was amazingly huge and delicious! Maybe one day your restaurant can provide the plant based Impossible Burger to your menu. I'm sure it would be a hit not just for Vegans but also non vegans! Thank you for great service and the gorgeous presentation of food! The service was so poor we left. The “server” finally greeted us after 5 minutes of waiting. He finally took our drink orders and then took another five minutes talking with the table beside ours. We walked out and not one person asked why! The food was old the butter wouldn’t even melt on the waffle. Nothing like the Las Vegas location. 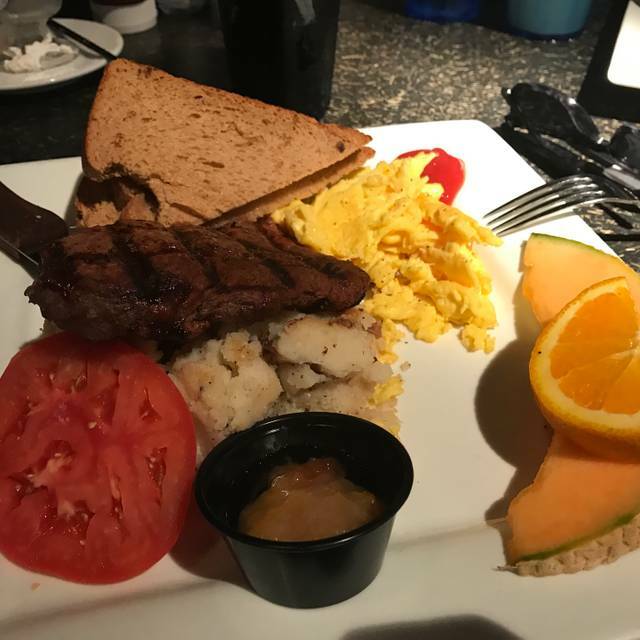 The good and drink are always "spot on" at Hash House a Go Go! Nice date night spot! Great food, big portions, reasonably priced and the service was great. Will certainly visit again. We went during the day around brunch time on a weekday, so not sure if it’s more crowded and noisy at other peak times. Service was fair. Not as good a the Las Vegas location. Noted in reservation it was for a birthday, but there was no recognition of the event. Service was excellent and food served as large portions and very tasty! Will go again if in the area. 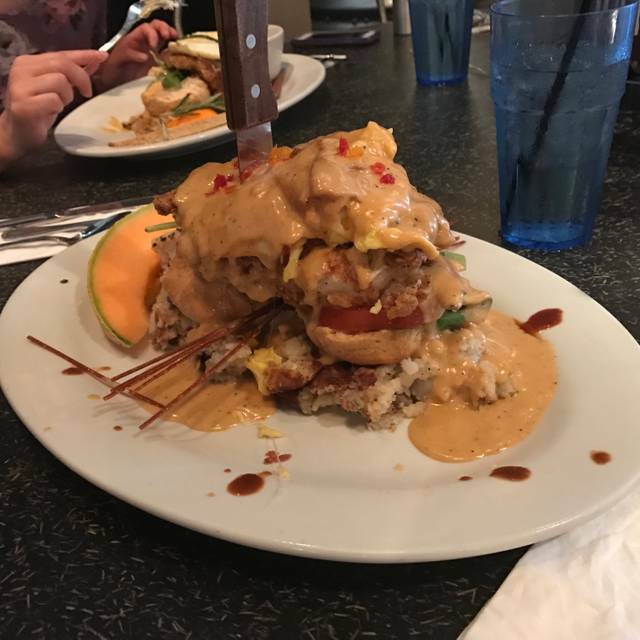 I’ve dined many times at the Hash House in San Diego, CA and the Plano location is a close second! 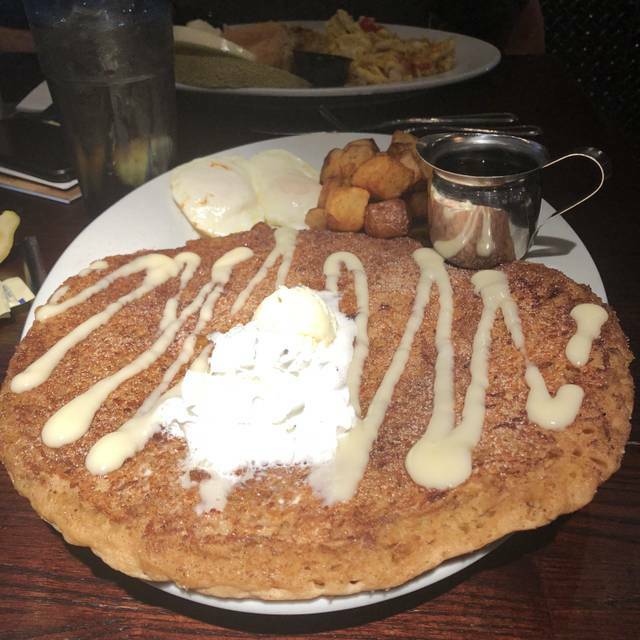 Ambiance is great, service was spot on, and the food was excellent (save for the buttermilk pancake, which was my only let down. There was nothing special about it, and lacked flavor). We will definitely be back because it’s overall a delicious place to eat! 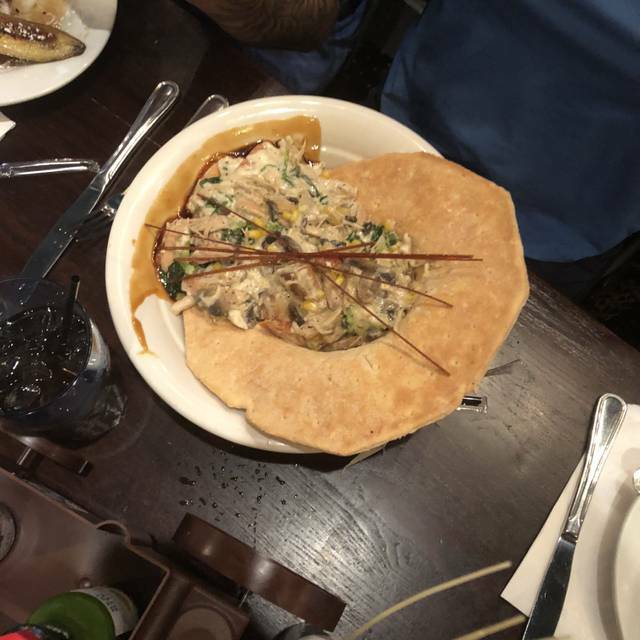 The vegetables were undercooked and everything felt rushed out of the kitchen. The food came out before the drinks we ordered from the bar! The waiter said he was missing staff members and handling most things himself, but it didn’t feel like he was really trying very hard. When presented with the check I told him it was the worst experience I’d ever had there. He was good enough to comp the entire check, which was nice, but it didn’t save the evening. I’d have rather paid the full bill and received the quality of service and food I’m used to at this location. Definitely make reservations. Menu is overwhelming so take a few minutes to review it. Food was good; HUGE portions, so be aware of that when ordering. The menu has SO many options, it was almost too much. Decided on a spicy fried chicken sandwich, and it was VERY spicy! I loved it! Also, the fries are great. We went for an early lunch, so the place wasn't that crowded. Great music was playing. I will definitely be back! Very slow this evening but service was very very poor. The honey butter biscuits “look” absolutely amazing; unfortunately there is no taste to the biscuit at all, u simply just taste the honey and butter on top, the biscuit is very bland and very hard!! Stated how we wanted it with some items removed! Second time to eat there. Brought a friend for her birthday. 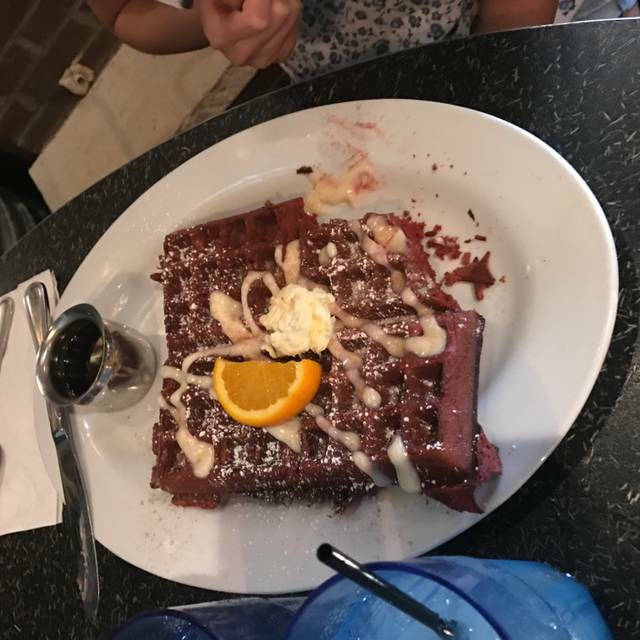 Told waitress ahead of time and she brought the red velvet waffle. Nice touch. Only complaint was there were no silverware or napkins on the table when were seated so I got up and got two from the next table and that silverware was taken after our meal. No silverware was brought to eat the waffle so I got the remaining silverware from the table next to us. Minor issue over all. My friend had the full rack of ribs-$20.99 and I the chicken strips-$7.99 and the spinach salad-$6.99. No complaints regarding the food. We will be back! Went on a bad night. Chef must have been on vacation. No hostess so my husband sat in his wheelchair in The foyer until I went to park the car. He was worried he would not be able to enter the restaurant to eat because all he saw were stairs. I helped him go around the bar and we found our friends. No waiter for us but the morning bartender took care of us and he was great. They were short staffed and the food was bad. Even the Cobb salad was bad. Pork tenderloins were dry and tough. That’s hard to do even on purpose. Sorry we went. Food is large, so if that’s what you’re looking for, great. But the quality of the brunch entrees was not great. No reason to go back. The kid-sugary foods got better reviews, so if you want a lot of sugar, maybe that’s ok for ya. Great service great food excellent prices. Beyond a great family environment. Quirky menu-just not in a good way. Restaurant must be owned by Baldar Conehead because if you go you will be “consuming mass quantities”. If outrageously huge portions are your thing, this is the place. Speaking for myself, I won’t be back. Essellent! Essellent! Essellent! Essellent! Essellent! Amazing food. Quiet and cute atmosphere. Excellent service as well. This is one place to have a family Sunday brunch. The staff and very accommodating and the food portions are not only delicious but huge. I had a blueberry pancake with two eggs, bacon and sausage and I must say, it's filling.